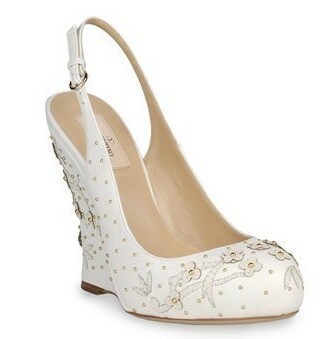 Valentino completes his amazing collection of shoes for spring summer 2012-style and romantic etiquette. Once again, the Italian fashion house surprised by inserting in his new collection of footwear models very beautiful, inspired by a mood almost retro but always sought to end that kind of love the lovers! It is the first model near this inspiration that we see in the new summer line, but in this case we also find some of the coolest must-have, that of floral patterns are everywhere lately, and especially the trend of very high wedges! As I said, in the past Valentino has shown his preference for this romantic style and etiquette, as we saw with the beautiful mary jane from the spring collection, and maybe even better looking through the pictures of the last parade of haute couture that has privileged flat shoes, but all very chic and sophisticated. Thus, in the best tradition of the brand, here are the photos of new arrivals in the line of the moment, we talk about decolletes with round toe, contrasting with the fashions of the period that favor narrow peaks, with a slingback decolletes completed with adjustable buckle. The model is made of white leather and the upper is covered with tiny white flowers, which among others are also of the wedge are 12 cm high and the interior plateau of 2.5 cm. A delicious and perfect shoe to complete day look more elegant, and incidentally mentioned that this year the white shoes are very fashionable! Can be found on the official website of Valentino at a price of 660 euros, you like it?